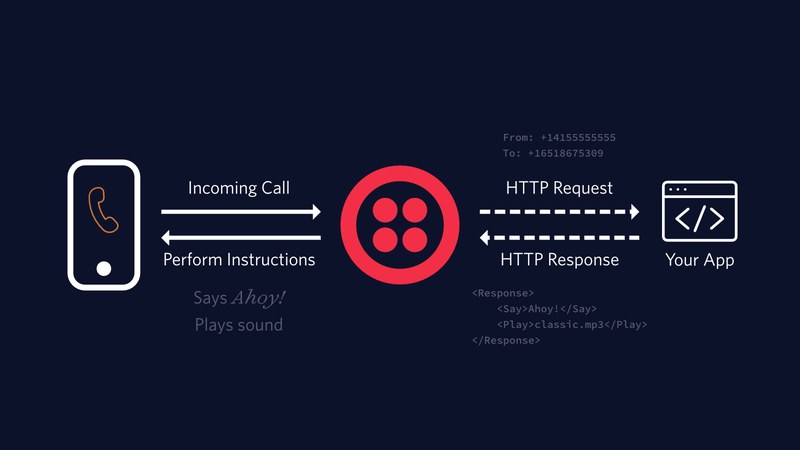 While it might be fun to program a robot to answer a physical phone, Twilio makes answering a phone call as easy as responding to an HTTP request. When a phone number you have bought through Twilio receives an incoming call, Twilio will send an HTTP request to a server you control, asking for instructions on how to handle the call. Your server will respond with an XML document containing TwiML that tells Twilio to read out a message, play an MP3 file, make a recording, and much more. In the console, you can search for and buy phone numbers in dozens of different countries, capable of calling (and being called by) just about every phone on the planet. A webhook is a callback mechanism that allows two systems to communicate events to one another over the Internet using HTTP requests. In this case, Twilio is sending a webhook request to your web application whenever a phone number you control receives an incoming call. You'll see this webhook mechanism used in many Twilio APIs for handling event notifications like this. In this example we'll use the Express web framework for Node.js to respond to Twilio's request and we'll use TwiML to tell Twilio how to handle the call. TwiML is a set of XML tags that tell Twilio how to handle an incoming call (or SMS). In this example we tell Twilio to read some instructions to the caller and then record whatever the caller says next. You can listen to your recordings in your Twilio Console or access them directly through Twilio's REST API. First, you'll need to get your Twilio account credentials. They can be found on the home page of the console.